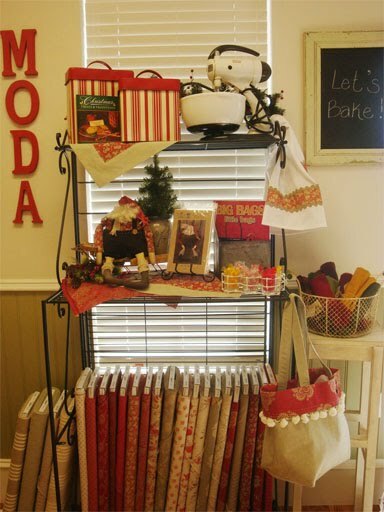 We can’t get enough of all the fun things you can do with Moda’s precuts. 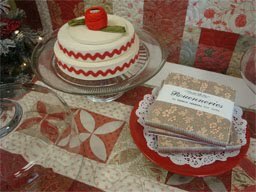 Our bakeshop features the Panache line and now we have added the Rounneries collection from French General. It is so much fun making displays from all of these collections. 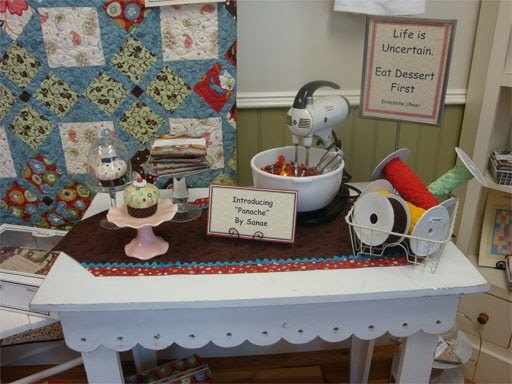 We also display many nostalgic kitchen wares to make the display pop! The mixer is filed with Hard candies. A great spot for when you need a bite of something sweet. 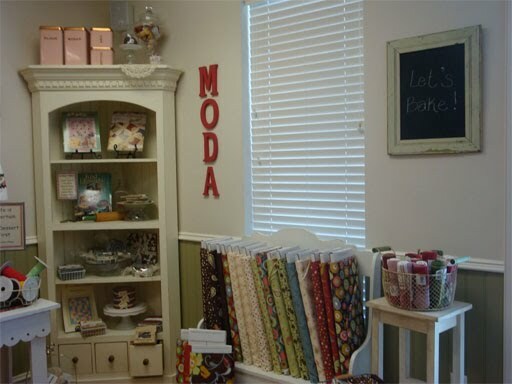 We have added a Moda Bakeshop Club to our class schedule. We meet the 3rd Saturday of the Month. If you are ever in our neck of the woods stop by and say Hi! I love the cornwagon shop! I live in Boston and went to Utah last year for vacation. 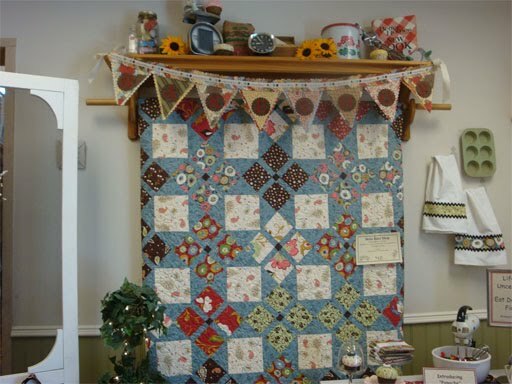 I took a list of quilt shops with me and Corn Wagon was one of my favorites! I'll definitely be back. 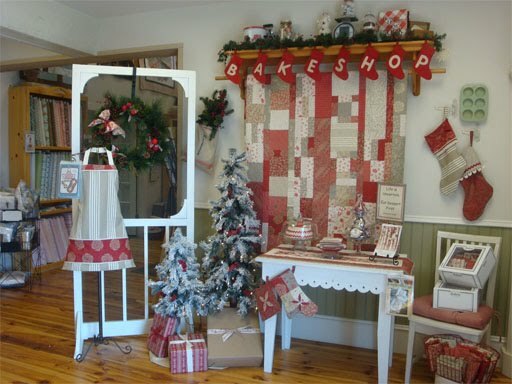 Went to the Corn Wagon Quilt Shop while in Utah for a family reunion…what a beautiful shop! Oh wow a place I can go! It's amazing that you can live in Utah and not know of all the fun and cool shops around!! And I am going to Springville tonight! Cornwagon is a great shop! 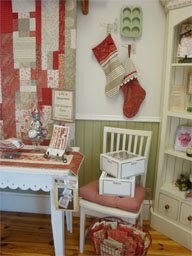 I'm from Springville as well and I love to stop in to look at the shop samples. One of my favorite shops!! Wonderful displays. I want to live there..can i? Ooooh! I love the Corn Wagon. I don't live in UT anymore, but whenever we go to UT, I always stop at the shop!! Wow — wish I lived out there so that I could visit all of the time!! 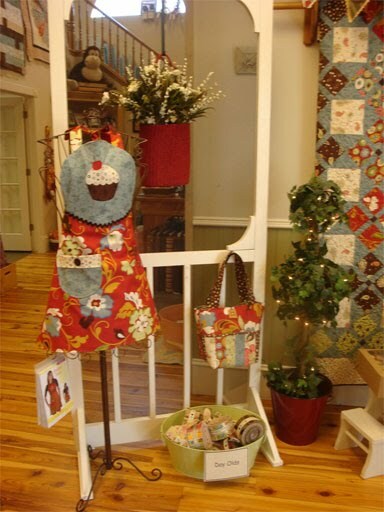 I know the cute lady, Shannon, who did these displays. She is amazing. 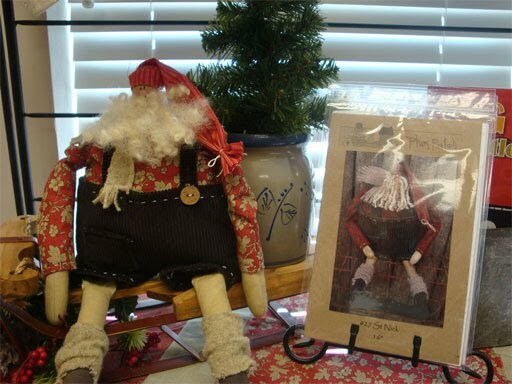 Corn Wagon is a fun place to shop, with so many inspirational ideas and a friendly staff. What a great shop! My mom lives about 5 minutes away and we visited the Corn Wagon shop when I was out in Utah last summer. I can't wait until next summer's trip, I'm definitely going back! p.s. when I was there in june I got some rick rack for a steal! Great displays. I sure wish I lived closer. Blessings! What a cute shop! Love your displays!!!! I had forgotten about the Corn Wagon. 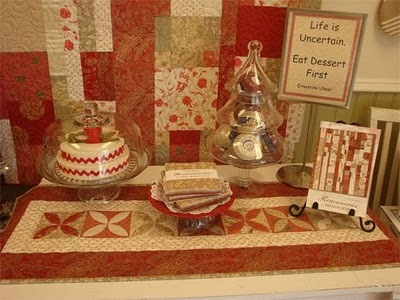 I made a quilt solely out of fabrics from there years ago. Love it. I love this shop!!! I was there a couple of years ago while on vacation! The Cornwagon is at the TOP of my list. They are kind and patient. . . very helpful. Their work is stunning. It's definitely a WOW!! My mother is one of the managers and I worked there while I was in high school. 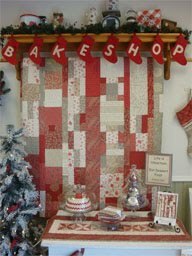 The quilt shop is up to date on the latest styles and trends and ones paycheck can easily disappear. I love the wonderful ladies that work there and the friendly atmosphere they bring. I love the Corn Wagon! 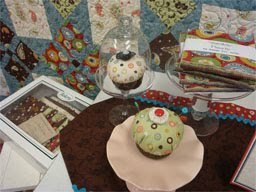 Being new to quilting and working with wool, they encouraged me and helped me along the way. Without them, I may never had the courage to try new things. Plus, they have EVERYTHING there. I keep looking at the displays over and over again. I love them! How perfect!! Oh my, Oh my I want to go to Utah & the cornwagon shop!! Wahoo to Corn Wagon!! I usually stop in at least once a month to see what the ladies are up to!! They are so nice and talented. Congratulations Marsha, MaryAnn and the gang. I got a gift certificate from the Corn Wagon for Christmas and so did my mom. I live just down the street. I can't wait to get over there and start some more projects. Plus, my friends mom works there! LOVE LOVE LOVE the Corn Wagon.